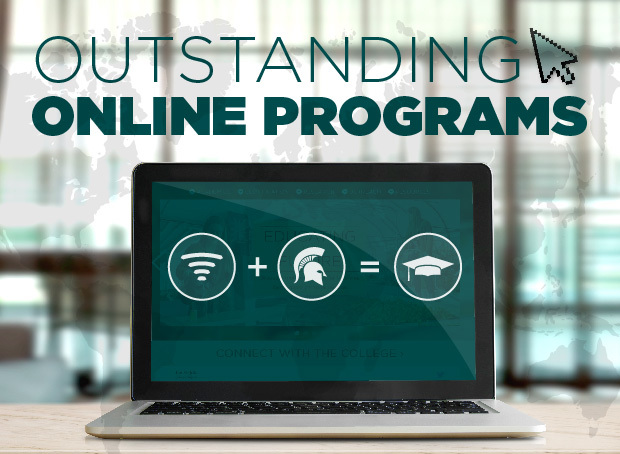 The Michigan State University College of Education offers online master’s degree programs for students who want to pursue advanced professional study through the convenience of distance learning. Students gain knowledge relevant in their careers by engaging with expert faculty members and classmates who live and work around the world. Students select from rigorous faculty-led courses, capped at 25 to ensure personalized interaction, based on their individual interests. They can focus in-depth on 1-2 areas of concentration and explore broadly across other areas. The programs also fit into various learning styles and schedules, providing learning opportunities anytime, anywhere. Advising is also readily available. In 2019, Michigan State University was ranked No. 5 in the nation for best online graduate programs in education, according to U.S. News and World Report. Also, see the full list of Graduate Certificates offered by the College of Education, including some fully online options. The Master of Arts in Applied Behavior Analysis (MA-ABA) prepares students to be highly competent behavior analysts in educational settings, and to develop and deliver educational and behavioral programming to children with autism, intellectual, and neurodevelopmental disabilities. Students will develop in-depth knowledge and applied competence in the delivery of behavior analysis to improve quality of life for individuals. Students who complete the MA-ABA program at MSU will be eligible to take the examination to become a Board Certified Behavior Analyst. Supervised fieldwork is included. The online Master of Arts in Education is for classroom teachers, school administrators, coaches or adult educators who want to enhance their professional practice while building on their prior professional experience and engaging in a dynamic online community. The program has six concentration areas: Literacy Education, P-16 School Leadership, Science and Mathematics Education, Special Education, Technology and Learning, and Sport Leadership and Coaching. The online master's program, which also is available on campus and overseas, prepares teachers, administrators, and other educational professionals for the thoughtful and creative use of technologies to support teaching and learning in a range of educational environments. Building on a strong foundation of the psychological theories of learning and development, the MAET program helps develop innovative educational leaders who seek to transform teaching and learning. *A three-course certificate program in educational technology is also available online and in many off-campus locations. The EPET hybrid doctoral program is a substantially online option in the educational technology emphasis area. This blended program is designed for experienced education professionals currently employed in schools, higher education and research institutions who want to earn a Ph.D. while continuing in their current positions. The goal is to develop the next generation of educational leaders who understand the need to create new technologically sound pedagogies grounded in innovative research and practice. The online HALE master's program is for individuals who are working in or wish to move into roles in higher and adult education, including administration, continuing professional development, or teaching. The program develops understanding of central issues in postsecondary teaching and learning, and a theoretical understanding of administration and leadership connected to practice. The Master of Arts in Teaching and Curriculum (MATC), which is completely online, is designed for beginning and experienced teachers, the majority of whom are teaching full time and deeply committed to public education and teaching diverse P-12 students. The program helps students engage in critical inquiry, develop as accomplished teachers and become teacher leaders. Students choose concentrations from the following areas: Educational Technology; Educational Psychology; K-12 Educational Administration; Literacy & Language Instruction; Socio-Cultural Perspectives in Teaching and Learning; Science and Mathematics Education; ELL/ESL. The online master's degree program in special education – which can lead to recommendation for teaching endorsements in Learning Disabilities or Autism Spectrum Disorders – is designed for K-12 teachers who plan to be involved in the education of students with disabilities. Students will learn research-validated instructional methods and evidence-based practices and will have opportunities to apply those methods in authentic classroom contexts to become highly skilled practitioners. *A six-course certificate program in Applied Behavior Analysis is also available online. The Graduate Certificate Program in Applied Behavior Analysis (ABA) will provide working professionals with the knowledge and skills needed to become a behavior analyst.